We appear to have established an irrefutable truth: you guys love mac and cheese as much as we do. Our recent round-up of the most decadent, lusted after mac and cheese recipes was a huge hit, as was our love letter to mac and cheese. But something truly special happened in the comments of "Macaroni And Cheese, We Love You": one brave commenter suggested something so insane, so amazing, so full of possibility, we had to try it. That's right. 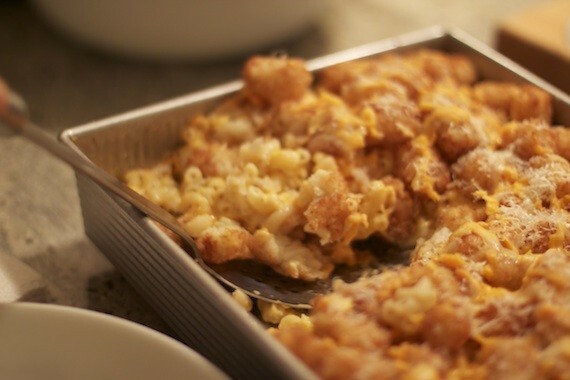 Macaroni and cheese with tater tots baked on top. How could we not tackle this challenge? Ladies and gentlemen, you asked for Tot Mac and you shall receive Tot Mac. This was... pretty much exactly how it sounds. Delicious, a marriage of two of our favorite things on earth and a complete and utter gut bomb. We've decided, for the sake of the deliciousness of the tater tots, that next time they might need to get mixed INTO the mac and cheese itself. For science. How was it done? We made our basic, no-nonsense, do not over-complicate things mac and cheese. We parbaked some tots. Then, we threw the tots on top of the mac and cheese, covered with more cheese (for science) and put it all back in the oven until things were appropriately melty. Thank you so much for your suggestion, brave commenter. Let this be a lesson to the rest of you: if you suggest something crazy enough in the comments, we might just make it!